A brief history of inward and outward investment in China; Statistics; China as a destination for foreign direct investment; China as an outward investor; Conclusion. Chinese economic reform has been undertaken through a series of phased reforms. The goal of Chinese economic reform was to generate sufficient surplus value to finance the modernization of the mainland Chinese economy. 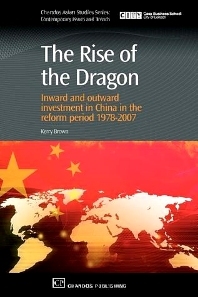 This book provides an assessment of where investment stands today and it's likely future role in China. It reviews China's interaction with the rest of the world as the country advances towards superpower status. Dr Kerry Brown was educated at Cambridge, London, and Leeds Universities. His first book was a study of the Cultural Revolution in Inner Mongolia, China. His second was a series of essays about the impact of China’s transition and rise on the West in the 21st century. He worked for the FCO for ten years, dealing largely with China and Asia, both in London, and China. He has visited every single province and autonomous region in China, and speaks Chinese fluently. He is Director of Strategic China Ltd, the only UK company helping the Chinese non state sector come to the UK, an Associate Fellow on the Asia Programme at Chatham House, an associate at the China Policy Centre Nottingham, a committee member of the British Association of Chinese Studies, and a Fellow of the Royal Society of Arts. He has commented on China in the Far Eastern Economic Review, International Affairs, The World Today, The Liberal, FT China online, and other specialist journals. He has also commented on China on Bloomberg, BBC, CNBC, The Guardian, The Times, and others.